I’d never traveled with a celebrity before. When we arrived at the airport in Costa Rica, it was a madhouse. People kept coming up to take pictures with my companion. Customs officials rushed us through the line after a cursory check of our documents. Baggage handlers competed to grab our luggage. It got to be a bit much when a police officer stalked over determinedly as we waited outside for our rental car to be delivered. “All our documents are in order, right?” I thought to myself nervously as he reached us and then stooped down to give the “celebrity” a scratch under the chin…and then asked me to take a picture with his cell phone. The celebrity in question, if you haven’t guessed, is not human. It’s my silver-haired standard poodle. 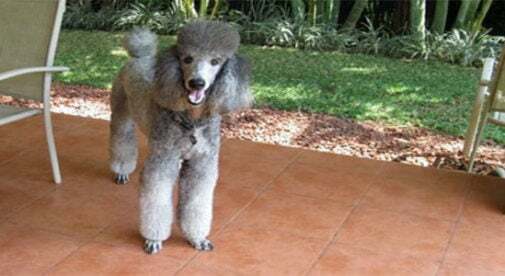 And thanks to a trip to the groomer just before we boarded the plane in Miami, Jester was quite a sight when we arrived at our new home in Costa Rica. It helped that poodles aren’t all that common in the country, so everyone was curious. Now, if you’re considering a move to Costa Rica and have dogs (or even cats), I can’t promise they’ll get the “star treatment.” But I can say that the process of bringing them over will be easy and hassle-free. First off, there is no quarantine here. Your pets come off the plane and are immediately in your hands. But you do have to take care of a few things before you leave. Go to your vet for a clean bill of health within two weeks of your departure date. And make sure they are up to date on their vaccinations for rabies and some other common diseases. You probably already have most if not all these shots. Your vet should give you a health certificate indicating your pet is healthy and has all their shots. Then you get it endorsed by the U.S. Department of Agriculture for a nominal fee. Just send (or bring in person) a copy of the vet’s health certificate to the USDA Animal and Plant Health Inspection Service office in your region. Once you have their sign off, you’re set. No need to contact the Costa Rican consulate. Just make sure you have four copies of each document just in case any official wants a copy during your trip. Small dogs can go in the cabin with you if they can fit in a carrier under the seat, but be sure to let the airline know beforehand. But larger breeds will have to go with the checked bags in a non-collapsible kennel with food and water. In both cases, the airline will usually charge an extra fee. American Airlines, for example, requires $125 per carry-on kennel, and $200 per checked kennel. For the health of your pet, most airlines will not let them travel when the temperature is forecast to be above 85 F anywhere on your itinerary. That’s usually not a problem at Juan Santamaria International Airport in Costa Rica’s Central Valley, where the temperatures usually stay in the 70s F during the day. But keep an eye on the temperatures in your departure city or at any connections. If it’s summertime in Miami, for example, you might have to fly out early morning or at night to stay under 85 F.
Of course, check with your airline for their specific policies and restrictions before buying your tickets. For their safety, some breeds aren’t allowed to fly during summer as checked baggage, including short-nosed varieties like pugs or boxers. And most of the “budget” carriers do not allow pets at all. Another option is to ship your pet as “cargo.” You don’t even need to be traveling with them. It’s great if you have a pet in the States but can’t fly back. You can handle this through individual airlines or through specialized services that charge a premium but handle everything.